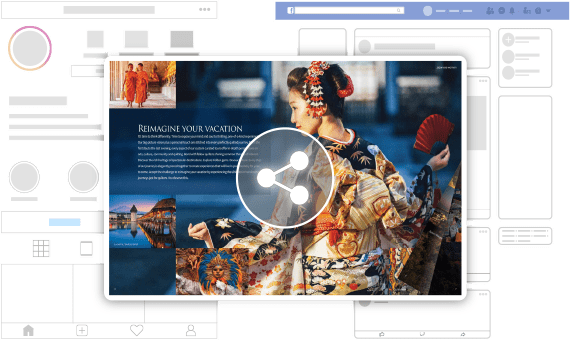 Increase your marketing outreach by sharing your flipbook on social media channels like Facebook, LinkedIn, Twitter, Instagram, YouTube, Google Plus and more. Big Savings: Cut printing and distribution costs by transforming your PDFs into digital flipbooks which can be shared on social media networks for free with only one click - no upload or download time required! Huge Outreach: Share on social media and distribute your content to a wider audience ...2.5 billion-wide to be exact. Inexpensive, simplified, effective advertising! Deep Linking: With our deep linking feature, you can drive attention to a specific page in your flipbook, automatically redirecting your readers to that page when they open your flipbook. This feature is perfect to highlight specific content within your flipbook (like a checkout page or specific itinerary). Viral Marketing: Let your viewers act as ambassadors for your brand by further sharing your flipbook on SoMe channels - effectively creating a free viral marketing strategy for your brand! Visit our guide and learn how to share your flipbook on social media platforms step by step.